WEIRTON — The Weirton Kiwanis Club will hold its 68th-annual John B. Sorrenti Sr. radio auction fundraiser Saturday featuring a variety of miscellaneous merchandise donated by Tri-State Area businesses and individuals. The auction will be aired on the Ohio Valley Sports Network, 1430 AM and River Talk 94.9 FM. The bids will be received by calling (304) 723-1430 on Saturday between the hours of 10 a.m. and 2 p.m. only. Patrons can call throughout that time frame to place a bid or to inquire on a previous bid. Each person calling in a bid will be entitled to a free guess of the identity of the auction’s “Mystery Voice.” Those guessing correctly will be eligible for a chance to win one of two $25 cash prizes donated by the John J. Sorrenti family. The telephone bids will be taken by Weirton Kiwanis Club members and volunteers. All money raised will be used to support various projects the club organizes throughout the year. Successful bidders can pick up their items at the Hancock County Savings Bank, 376 Three Springs Drive, Weirton, during regular business hours on April 15. President Gary Mastromahalis expressed appreciation to businesses and individuals who contributed to the auction over the past years. “Their participation in our project ensures its success,” he noted. Kiwanis International is a global organization of members dedicated to serving the children of the world. For information on Kiwanis, visit www.kiwanis.org or call (304) 374-0308, Kitty Kochman, Weirton club secretary. STEUBENVILLE — The annual observance of the solemn ceremony of the Feast of the Paschal Lamb will be held Sunday in the Steubenville Masonic Temple, 227 N. Fourth St. The ceremony is under the auspices of the Drummond Chapter of Rose Croix, Ancient Accepted Rite, Valley of Steubenville. The service will begin at 3 p.m. and is open to the public as well as Scottish Rite Masons, their families and friends. The address will be given by Roger Criss, elder of Cove Presbyterian Church in Weirton. Criss was a police officer with the Weirton Police Department, retiring after 30 years of service. He also is a retired investigator of the West Virginia Lottery Commission. The annual service is a reminder to Christians of Holy Week and to the Jewish faith of Passover, acknowledging the celebration of both faiths. The service is built around a series of tableaux taken from the King James Version of the Holy Bible, according to a spokesperson, and is further enhanced by dramatic scripture readings and music provided by the Scottish Rite Choir and other church choir members, under the direction of Alice Birrell with June Myers as organist. The service also is a memorial for those members of the Valley of Steubenville who have died during the preceding year. The observance of the Feast of the Paschal Lamb is one of the oldest ceremonials in existence, the spokesperson added. WELLSBURG — The Brooke County Pastors Network community Lenten services are continuing through Easter Sunday, April 21. Thursday’s service will be held at 7 p.m., at Wellsburg Presbyterian Church with the Rev Lori Williams delivering the message. Easter sunrise services will be held at Brooke Hills Park, led by the Rev. Annie D. Parker, and at Old St. John’s Episcopal Church, led by the Rev. Phil Van Dam and the Rev. Frank Lewis. Both begin at 7 a.m. It will be held from 9 a.m. to 3 p.m. Thursday; from 9 a.m. to 7 p.m. Friday; and from 9 a.m. to 1 p.m. Saturday at the R.J. Bush Center, directly behind the Mercy Baptist Church located at 3474 Pennsylvania Ave.
Saturday will be half-off day, and anything that does not have a hole punched in the tag will be sold for half off. 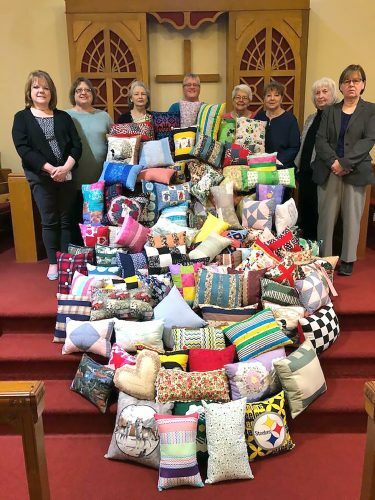 RICHMOND — The 150th anniversary of the Richmond United Methodist Women was celebrated when the group met March 28 at Richmond United Methodist Church. Connie Somerville prepared the program, assisted by Gloria Mercer. The scripture reference was Matthew 26:6-1. Mercer read a poem by Dorothy J, Collins and closed the program with prayer. At the business session, President Marge Andres led members in reciting the purpose. Reports were given by Sue Frye and Joyce Proffitt. Members going to the spring district meeting at St. Clairsville were reminded to RSVP. Andres read from the prayer calendar. The mission focus was Democratic Republic of the Congo. Children’s programs were the district focus. Plans were finalized for the Jefferson County Retired Teachers Association luncheon to be served Tuesday by the Richmond UMW. Andres closed the meeting, reading from the 1992 UMW program. Birthday cake and ice cream rounded out the celebration. The next meeting will be held April 25. STEUBENVILLE — The Agape Apostolic Assembly Food Pantry is sponsoring a benefit dinner the help raise funds to build the food pantry distribution and warehouse center. The dinner will be held on Saturday, beginning at 5:30 p.m. at Agape Assembly dining hall, located at 525 Slack St., Steubenville. The dinner donation is $25. Elder Robert Montgomery is director. WEIRTON — The Tri-State Marine Corps Club Auxiliary met March 11 with President Shirley Brecht presiding and leading in opening ceremonies. Chaplain Mary Ann Smith gave the opening prayer. Sunshine Chair Mary Ann Elliott reported on cards sent. Reports were given by Secretary Marcy Spano and Treasurer Gloria Jerrel gave the financial report. In December, Gloria Jerrel and Brecht took Christmas gifts to veterans at the Weirton Geriatric Center, it was noted. The bakeless bake sale will be held through April 30. Fliers will be sent to members of the Marine Club and auxiliary. Proceeds will benefit the veterans in club and nursing home. The auxiliary voted to make a $100 donation to the Community Bread Basket again this year for Easter. The group selected its adopted veteran for 2019. The announcement will be made at the next meeting. The group also voted to not have meetings in January and February because of inclement weather. The auxiliary will prepare Easter baskets for the veterans at the Weirton Geriatric Center. The 50/50 was won by Leroy Bee won the 50-50 drawing, donating it back to the treasury. The next meeting will be held on April 15. STEUBENVILLE — Planners and volunteers involved in organizing the 2019 Jefferson County Relay for Life will meet at 6 p.m. Tuesday at Clarke Hinkle Stadium in Toronto, the site of this year’s event in June. “We are discussing logistics, campsites and set-up along with team fundraisers,” explained Emily Russell, who is serving as relay co-chair along with Tom Simmons. The relay that will be held from 6 p.m. on June 21 to 9 a.m. on June 22 at the Toronto Jr.-Sr. High School Clarke Hinkle Stadium, located at 300 Myers St. in Toronto. Tracy Barnhouse of Noble County is the local relay’s ACS community development manager. For information, contact Barnhouse, ACS community development manager, by phone at (740) 509-0196 or by e-mail to tracy.barnhouse@cancer.org. Russell can be contacted via e-mail at emily.relay19@gmail.com. For information about the ACS and services and programs it offers, visit cancer.org. The cancer helpline number is (800) 227-2345. STEUBENVILLE — The Ohio Beta Alpha Chapter of Alpha Delta Kappa Teacher’s Sorority met April 2 at Malara Hall in Steubenville. President Peggy Pyle introduced Crystal Fluharty, a member of Beta Epsilon Chapter and an Indian Creek teacher. Fluharty presented a program, “Project Wild,” which can be used outdoors and for all subjects. It is a hands-on approach offering interaction among students. Fluharty gave members books that she uses for this project. Chaplain Pam Fithen read “The Wonder of Easter. Joyce Cammilletti read a thank-you note from the Aim Women’s Center for money sent. Cammiletti also led members in a “Do You Know?” quiz for fraternity education. 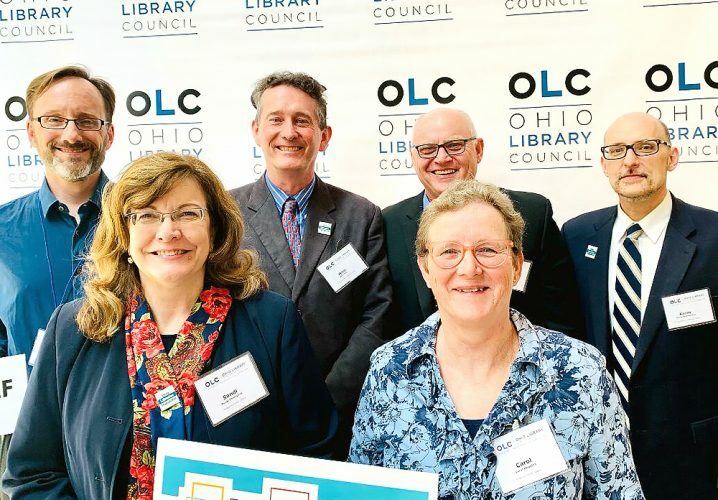 The scholarship committee will meet Tuesday at the Schiappa Branch of the Public Library of Steubenville and Jefferson County to select the recipient of this year’s scholarship. Members collected money for Valley Hospice. The chapter will help area students this summer by sending money to Toronto School’s Food Pantry, Indian Creek’s Food Pantry and the Sycamore Community Center’s in Steubenville. Susan Nolan, a member of Beta Epsilon and future state president of Alpha Delta Kappa, encouraged members to attend the state convention in Columbus this month. Past President Jane Brower was presented a retirement gift. Members were reminded to pay their $15 assessment next month in lieu of a fundraiser. Hostesses were Jane Brower and Sue Davidson. The next meeting will be the salad and dessert dinner on May 7 at Malara Hall in Steubenville. Hostesses will be Debbie Danley and Dorrie Mallas. STEUBENVILLE — The Tri-State Winemaker’s Club held their March 14 meeting at Holy Trinity Greek Orthodox Church in Steubenville. Dan Greathouse, executive director of Top of West Virginia and Visitors Bureau, attended the meeting, requesting the club’s participation in a wine-tasting at the Weirton Event Center on June 14 in conjunction with the Friday concert series. Jill West, a blues singer from Pittsburgh, will be performing. Club members agreed to the request. President Jim Cope led a discussion about unusual wine descriptions such as angular, barn-like, cigar box, fat, flamboyant, musky and spineless. The next meeting will be held at the church on Thursday, beginning at 6:30 p.m.
WEIRTON — Fifteen piano students from Torrance Music Studios in Weirton auditioned for the Thursday Music Club, Wheeling, on March 29-30. Gerald Lee, a music professor at West Liberty University, was the judge. 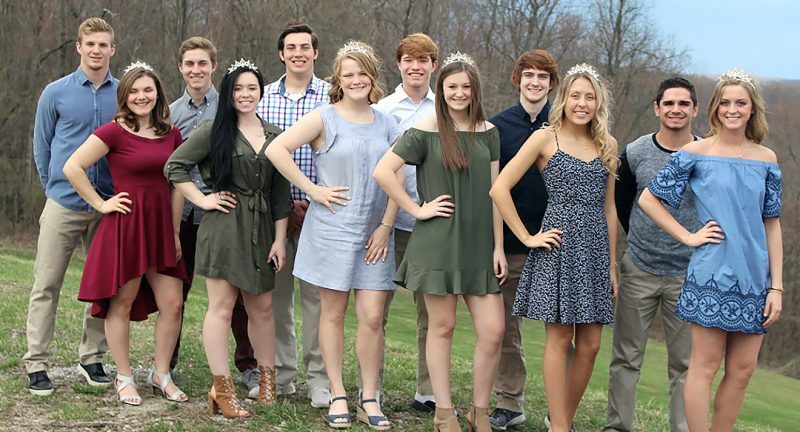 Those receiving superior ratings were Laila Reed, Tyler Haddon, Brayley Lash, Guy Meneely, Mason Mackey, Katie Costa, Juliana Velegol, Jackie O’Karma and Johnny O’Karma. Excellent ratings were awarded to Addison Orecchio, Andrea Alimario, Catherine Glodowski, Cameron Michaud and Sandy Rao. These students and other piano, voice, guitar, ukulele, organ and violin students will present a free recital on June 2 at Memorial Baptist Church, Weirton. Programs will begin at 2 p.m. and 4 p.m. and are open to the public.